Some weeks ago, over a bottle of Sauvignon Blanc and a roast chicken. Me: I finally did it. A Sarah: You changed your *Shindigging tea didn’t you?! I knew it was different. A Kate: You two and your tea. You’re such *doodle-pips. A Sarah: Just because you’re a tea *whoobididoo, doesn’t mean we have to be. A Kate: Well *knock my socks off. That’s brilliant! A Sarah: *Flippity-jib yeah! That’s the funniest thing you’ve ever told me. Me: I figured the only way to make it less embarrassing was to write it, laugh it off… Does that make sense? A Sarah: Word, mother *frangipani. Me: You two age me. Horribly. And so ladies and gents, here, I give you my most dreadfully embarrassing encounter, with a doctors’ surgery, a couple of bored toddlers and a medical procedure no woman likes to endure. Proudly posted on Life, Love and Dirty Dishes for the delightful Claire’s Rookie Mistakes series; thank you Claire for sharing the story that will (hopefully) make you laugh, cringe and always arrange childcare when you need to head to the doctor. Check out Claire’s blog here. I have always been of the opinion that I should be able to take my children anywhere. I often chirp to my husband ‘Well, I have to take ours everywhere, so they might as well learn to behave!’ and in some way that’s true. My mum, dad and sister live over 300 miles away, so if my friends or sister and brother in law are unavailable, they do have to come with me. But as for learning to behave…we’re working on it. This story is not one of those bad behaviour tales, it’s a story of such an obvious rookie mistake, and I still (still) blush when I think about it. I had booked to have my smear test on one of my days off, it’s something I’ve always been really insistent not to put off. A close friend of mine had an awful scare and I have always made promises that I would never delay it once the letter came through. At the time, my son was 5 and at school, my daughters almost 3 and 18 months old. I remember the thought process very clearly: Ugh, great. OK, well Monday is the best day to get it out of the way…little one is still really clingy, so she’ll have to come with me. If she comes on her own she’s likely to be shy and want to sit on my knee, but if her sister comes, they will just play with the toys in the doctor’s office and won’t be aware of what’s going on. Yes. That’s what we’ll do. Sometimes you’ve just got to take them with you! In my infinite wisdom I decided not to wait until I had someone available to look after my girls during the appointment. We would all go together: it would be fine. I could just end it there and let your imagination do the work, because it’s clearly going to end in disaster, yes? I don’t know about your GP surgery, but mine is always heaving on a Monday morning. So busy it is usually standing room only. But silent. Not one word is spoken between people, just sidling dirty looks that say: you don’t even look ill, she’s not limping, he hasn’t even got a cough! And so on. It’s a miserable place at the best of times but Monday morning is the worst. In the small ‘play area’ there is a play table with a Duplo board and four small chairs with a pile of books. Daughter 1 (we’ll call her The Talker) started asking a dozen questions at Church Volume (i.e. very loud). She wanted to know why we were there, which one of us was getting a jab, how long it would take, why the elderly lady across the aisle had a bandage above her eye… it went on. Daughter 2 (we’ll call her The Scraper) decided to best pass the long wait, by taking each one of the small plastic chairs and systematically dragging them from one side of the ‘play area’ to the other. And we all know what a lovely noise that makes and how well it would be received in a silent waiting room. The nurse, quite used to these uncomfortable scenarios, quickly got the box of toys out of the cupboard and talked me through the procedure and we laughed about the indignities suffered by women, I felt fine. She praised my good sense in wearing a skirt to preserve some sense of dignity and shut the curtain leaving my daughters playing quietly on the other side. Out came the speculum and at this point I shut my eyes. After 3 children, countless internal examinations, stitches, you’d think I’d be immune to this sort of thing. The fact is; I hate it just as much as the very first time. I shut my eyes like a child and waited for the ‘All done!’. At this point I opened my eyes to see the nurse standing, reassuring and professional. Just behind her, stood my 2 daughters, having crawled under the curtain, staring up through my legs in open mouthed horror. That moment seemed to last a lifetime, all I could think was why, why did I put myself through this? And WHEN will I learn? I could not get out of that office fast enough. Carrying The Scraper on my hip, dragging The Talker by the hand – she was understandably stunned into silence. The best part is the that your skirt was tucked into your pants. Sooooooo funny! 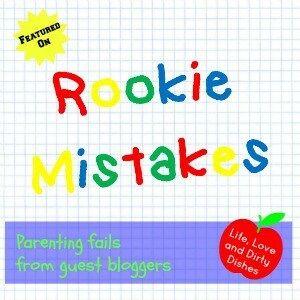 I’m heading over to Rookie Mistakes right now to see if any of my own have been posted yet! I love self-deprecating humor – it’s my favorite, and luckily I have TONS of material to grab from! Thanks for making me laugh on a Monday morning! Thanks Barb! There are some hilarious examples – always a good read on Life, Love and Dirty Dishes. Self deprecating humour is also my specialty – best way to survive parenting don’t you think? Blunt Moms is syndicating this post tomorrow – gulp! I love your blog Claire, I feel really privileged to have been part of it!